(Photo: World Alliance of Reformed Churches / WCRC)Theologian Douwe Visser of the World Communion of Reformed Churches is seen in an undated file photo. Theologians will meet in Switzerland this week to discuss a possible model for bilateral dialogues between Reformed church theologians and Lutherans, Catholics and Pentecostals. The model involves emerging young ecumenists, according to the Geneva-based World Communion of Reformed Churches. The discussion is part of the agenda for a March 3-8 meeting in Rüdlingen, in the northeastern part of the country. Organizers expect 22 participants from 15 countries, with about 20 percent of them under the age of 35. The WCRC's Theologians' Network meeting aims to reflect on the priority issues for theological study in the coming year. "We will be asking ourselves how best to set priorities for theological reflection that will address current concerns facing the Reformed church movement as well as the broader ecumenical environment," said Rev. Douwe Visser of the WCRC in a statement. Rev. 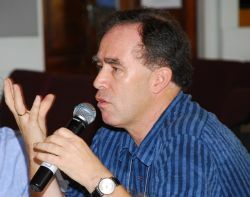 Visser, who is a member of the Protestant Church in the Netherlands, leads the WCRC's Office of Theology and Communion, which is responsible for interchurch dialogue and the formation of theology students and new pastors for leadership in the global church movement. Part of the meeting also includes drafting plans for the next session of the Global Institute for Theology for new pastors and theology graduate students in 2014. The Institute provides training in ecumenical theology and dialogue twice a year. The upcoming issue of Reformed World will publish papers presented during the meeting in Switzerland.